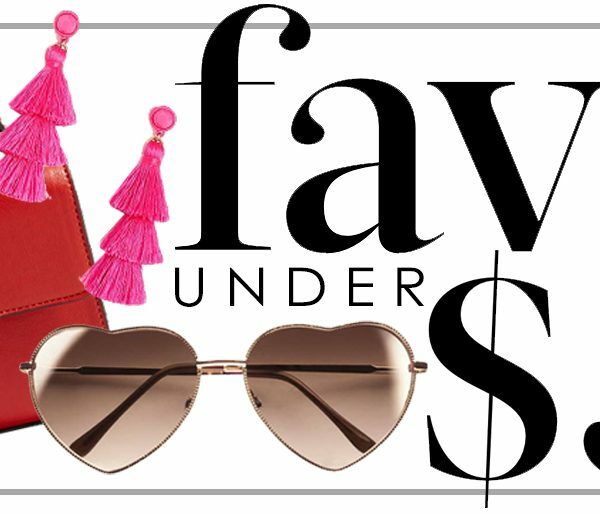 Faves Under $50 | Travel Edition | hi Sugarplum! Welcome back to a new week, friends, I hope your weekend was grand! We landed in Copenhagen Saturday night, and embarked on the Regal Princess yesterday! It was so fun to meet up with our blogger friends from previous trips, so follow along on my Instagram Stories to see behind-the-scenes of our cabin, travel mates, and exploring Oslo, Norway today! 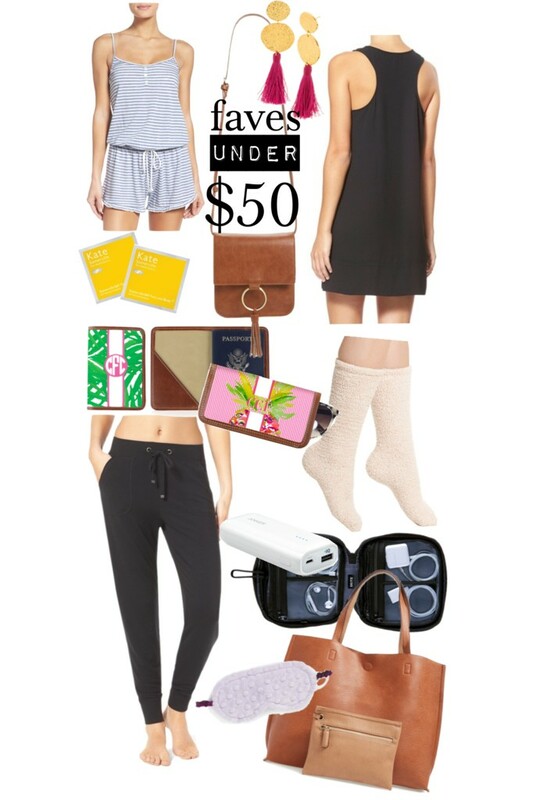 Obviously I’ve had travel on the brain, and spend an obscene amount of time online, so today’s Faves Under $50 is all about my travel favorites and necessities! And all under $50! one // We’ll have three at-sea days on this trip, and this striped pajama romper will be perfect for lazy days and room service! This eyelet set came with me too…I can’t even with the back (size up)! five // Crossbody bags are my favorite for traveling since they keep both hands free, and stay close to my body. With the rich cognac, brass ring, and tassel, you’d never know this bag wasn’t designer-luxe. It’s the perfect size for my wallet, phone, gum, and lipsticks…so basically everything I need for a day of exploring. six // Can you believe this trip will take us to seven countries?! Too bad I can’t get my passport stamped at each stop. At least it will look cute in this monogrammed case! eight // This cozy cardigan is part of my nightly ritual, and now they make socks in the same material!! #heaven I wore them on the plane and positively swooned! 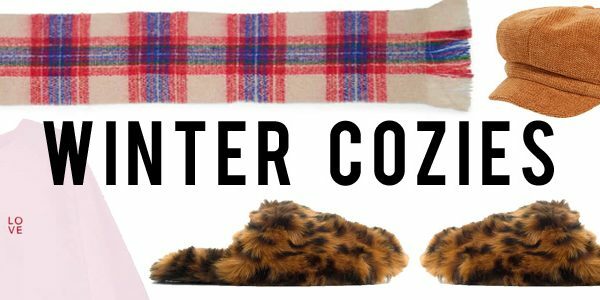 I have a feeling I’ll be living in them when we’re hanging out in our cabin. ten // We added an international package to our phone plans, so we’ll be able to use our phones freely…but social media is a battery-sucker!! This portable charger comes with me on every trip so I don’t have to worry about running out of juice mid-day. eleven // But what about all those cords and chargers?! This little organizer has compartments for everything, and zips into a compact case for tucking in your suitcase or carry-on. twelve // I don’t sleep much on long flights, but a soft eye mask at least helps me tune out the people around me. thirteen // We checked our big suitcases, but I like to carry on a big tote for things we might need during the 20-or-so-hours of travel…this tote looks so chic, holds a ton, and is a great everyday bag once you arrive at your destination. As for skincare, I like to continue my same routine regardless if I’m at home or the middle of the Baltic Sea…so I bring these travel sizes of all my skin care favorites. The Discovery Kit is a little over $50, but considering it’s a $150 value (and normally $95), I couldn’t leave it off this Travel Essentials list! Oh, the other random purchase I had to make, considering we’re gone two weeks, is more undies!! I’ve gotten to where I won’t wear any but these, so I had to stock up! Update: I can’t even believe I compiled an entire Travel Essentials list, and left off my biggest life saver….these packing cubes. I can’t rave about them enough. Honestly, they’re so good, I might dedicate an entire post to them. They are amazing at keeping your clothes organized, categorized, and wrinkle-free…not to mention, they keep your suitcase from becoming completely disheveled! My entire family swears by them now. What great deals have you spotted lately? 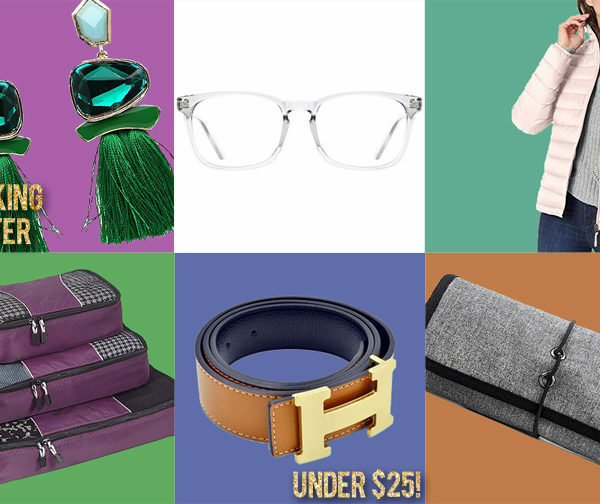 Find more Faves Under $50 posts here, and more of my Travel & Packing Tips here. You chosen really great items! I must use a crossbody bag while travelling. They’re so convenient and they feel safer (and are lighter!) than a backpack. I might have to give those socks a try! I love my barefoot dreams cardigan. Have fun! Ah, packing cubes, how they have change my life! I just started using them (I use the Eagle Creek version) this year (so five trips now) and it’s unbelievable how much easier they make packing a suitcase and then living out of it for the duration of the trip. Even using one in my carry-on for my overnight trip was brilliant because it kept the clothes nicely contained in the same bag I carried my laptop in. Game changer! Also, the shoe bags (for a single pair) were brilliant to have in DC last month. I commuted in the sloppy winter mix in my tennis shoes and carried my dress shoes in a shoe bag in my work bag. Yes, I could have used any old bag, but the shoe bag is so much nicer looking, waterproof, and not bulky. I have the cross body bag and love it. Tiny but stylish. Yes, please do a post on the packing cubes, Cassie!